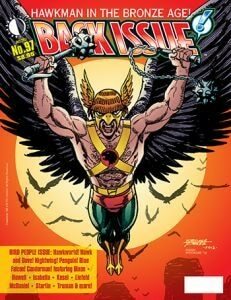 This issue of ‘Back Issue’ is devoted to bird people or rather super-heroes with name associations to them more than powers similar to birds. Editor Mike Eury gives a list of characters that have already been covered in earlier issues and this issue is predominately DC characters. Having said that, both lists seem to omit and I only pondered a little: Red Raven (maybe his earlier incarnation is too golden age), Nighthawk, Starhawk and Darkhawk. Looks like Marvel thought having the Angel was enough. Then again, DC’s LSH member Dawnstar don’t get a mention neither. Enough room for another issue on the topic in the future methinks. I have to confess I’ve always had problems with Hawkman. The mask doesn’t allow for very good posing or rather from different angles if you’re drawing him and I’m sure the wings were to make mask more interesting, too. His bare-chest and arms must surely allow him to get injured more. His power of flight is dependent on the Nth metal in his belt than the wings on his back which are never really clued in as to how they function let alone how they are controlled. Seeing the Golden Age Earth-One Hawkman in a 1960s JLA/JSA team having his wings held on by magnets and being pulled off was hardly reassuring. Oddly, I think I preferred Hawkgirl/woman simply because she had the better mask even if she has similar problems. At least as the years went on they started to carry weapons. Interestingly, there is a box further in discussing their uniforms and it’s noted the male bare-chest version is their dress uniform. Doug Zawisza’s examination of the Thanagian Hawks from the Bronze Age, that’s 1970s-1990s shows how they survived sans a title of their own and the various issues they had to solve, not least of which not being able to return to their home planet and then the Shadow War. Something that was discussed was Hawkgirl not being let into the JLA because Superman said they wanted to avoid having duplicate powers is still startling. I mean Supes makes the Flash, Martian Manhunter (except he could also shape-shift), Aquaman, Wonder Woman and Hawkman redundant on the spot. Steve Englehart sorted that out so she finally became a member. I think a better reason would be those who have similar powers would tackle the villain the same way and probably get in the way of each other. Of course, this is redundant in the case of the Hawks as they were a team. The next biggest topic is DC’s ‘Hawk And Dove’ team, although both have more in common with political extremes than birds of the air. I tend to have odd moment of illogic getting around characters who transform into their super-powered counter-parts by saying their name. It’s so easy to transform accidentally and practically impossible to introduce yourself. Mike Eury’s look at their history doesn’t cover that problem but you do get a look at their lives. About the only picture missing is when they slipped into a different dimension and looked more like they should have looked than super-heroes. The look at Hanna-Barbera’s ‘Dynomutt And Blue Falcon’ duo by Mark Arnold tends to centre on the dog than the bird. Then again, like their Scooby-Doo, dogs were always a scene-stealer. The ‘Rough Stuff’ showing pro work has one of the best pictures of Black Canary I’ve seen in a while by Bart Sears. Going back to the birds, we have a look at the comicbook and film versions of ‘Condorman’ by Andy Mangels that I missed in its original showing. What I found fascinating here is the various promotions to encourage the American audience to go and see it. I often wonder if they were carried out and it would be interesting to see if ‘Back Issue’ will take a gander that way one day. Most we would get in the UK is lobby cards. Finally, there is a look at Nightwing and his solo series when he takes on crime in Blűdhaven and John Trumbull interviews creators Chuck Dixon and Scott McDaniel about their run on the title. As ever, ‘Back Issue’ will stir memories of your old comicbooks from the Bronze Age period. The balance between art and text always makes for a visual treat.